Chef Watson's tasting menu also included a vegetarian Greek burger and a plantain dessert with papaya. At first glance, it might not seem like strawberries and chicken have much in common. But look closer, and you'll find it: the flavor compound g-dodecalactone. That sciencey-sounding gobbledygook probably doesn't mean much to you, but it means a lot to Chef Watson, IBM's (IBM) cognitive computer. Chef Watson understands food on a molecular level, and works off the theory that things that share similar flavor compounds taste good together. That knowledge makes Watson an interesting sidekick for both professional chefs and home cooks. But Watson isn't just a chef. It's a computer system that learns by reading books, articles, or whatever you feed it. The cognitive system has been put to use in finance, healthcare, engineering and, most famously, on Jeopardy! But this week, it was all about the food. I sat down for lunch with a few people from Watson's team to sample what a computer can come up with when given free rein in the kitchen. The first thing I noticed was that the menu was like a very strange fusion restaurant. There was a Turkish-Korean Caesar salad, Indian turmeric paella and Belgian bacon pudding for dessert. "Chef Watson is going to suggest ingredients I'd never use and that's what's going to be surprising to me," said Florian Pinel, the project's lead engineer. In other words, Watson is coming at recipes with no preconceived notions of what they should be. It will throw together ingredients with more freedom than us humans, who may not like cooking certain things or using specific ingredients. Plus, its database pulls from cuisines of about 30 countries. Users can select recipes with Watson (it's available to the public in beta). They start by giving it some parameters about what ingredients to include and what to exclude. There's also a slider that goes from "keep it classic" to "surprise me." Chef James Briscione, the Institute of Culinary Education's director of culinary development, prefers "surprise me." He worked with Watson on my lunch, which used recipes from a cookbook published last month, "Cognitive Cooking with Chef Watson." My favorite dish was the Caesar salad with eggplant puree (Watson's idea) and fried artichoke "croutons" (Briscione's idea). 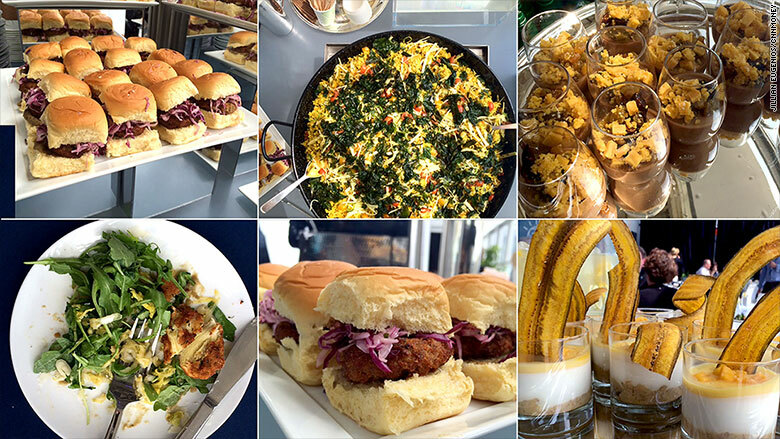 Watson gets its ideas from a database of 10,000 Bon Appétit recipes. It uses machine learning, which means the more data it has, the smarter it gets. Through Bon Appétit, it has learned how to build recipes, understand proportions and has seen which ingredients are usually paired together. It has also had to learn little things that humans take for granted -- like that you can shell a lobster but not a salmon. Its ability to understand flavor compounds is important because it's something that would take us forever to do. Take a tomato: it has over 400 compounds. Trying to make a dish based on that information would take "hours upon hours," according to Briscione. For Watson, it takes seconds. But the technology is still evolving. It was only last year that regular people were able to start accessing Chef Watson, and there's a reminder on the site that Watson "eats data, not real food ... give us feedback to make the Chef smarter." Users have asked for more items in the database. A popular request has been sea urchin. But, Pinel said, it's only a matter of time: "Give it one sea urchin and it will start adding it to recipes."